Well hey, here's a totally boring figure! 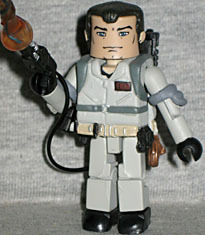 He was originally available in the first Ghostbusters four-pack, so it makes sense that he'd be a plain version, but still, after all the fun versions we've gotten, he seems... dull. No superfluous detailing on his suit, no fun expression on his face - it's just a vanilla Venkman, which is terrific if that's what you want. He has a removable radio on his belt, and a stream of proton energy that fits onto the end of his gun. Worshipped by the Hittites, Mesopotamians and Sumerians for eons the entity known as Gozer uses its demi-god minions to locate and possess suitable human hosts. Dana and Louis only barely escaped spending eternity as Zuul and Vinz Clortho. The Terror Dog was also included in that first four-pack, but it was a solid beast, not like this one. This is the Energized Terror Dog, depicting the scene where the Gatekeeper and Key Master are transformed by mystical, and are briefly transparent with lightning coursing over their bodies. 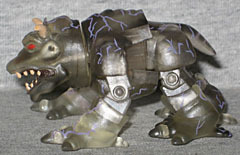 This figure is a smoky translucent gray and has lavender electricity streaks painted on. There's a standard Minimate body deep inside the figure, but instead of arms, it has a second pair of legs. The front legs are on backwards in the package, for space-saving reasons. When you buy it, you'll want to pop those off and reverse them. To bulk up the doggy, he gets big new feet, a torso with a prominent spinal ridge, a waist piece that also provides his tail, and a perfectly shaped head with bone-colored horns, red eyes and an open mouth. 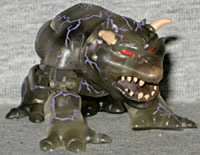 The same pieces are used for all three Terror Dog releases - solid, clear like this one, and a blue one based on the cartoon. Peter Venkman is a perfectly fine offering, even without anything to make him special, and the Terror Dog is worth it even if you already got the "solid" one. Who could ask for anything more?